Our Amish made 60” corner entertainment center is perfect if you are looking for fine Amish quality without a lot of fancy features. 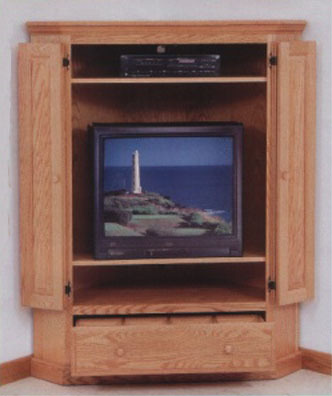 Shown here in solid oak, it still features a large TV opening, but features 2 adjustable shelves instead of the sliding TV swivel, and is a little more compact even though it is still a full 5 feet tall. It features a single drawer on the bottom with handy tape dividers, and an attractive pair of oak bi-fold doors to cover up the front. The top has less fancy trim than some of the bigger models as well, which saves you money. This unit is probably more suited to someone who does not have a whole lot of fancy audio/video components, but it is still roomy inside, and there is plenty of room on top. The shorter height also makes it easier to reach if you do put your equipment on top. Front opening is 33.5” Wide x 43.25” High - Max TV Height depends on location of adjustable shelves.